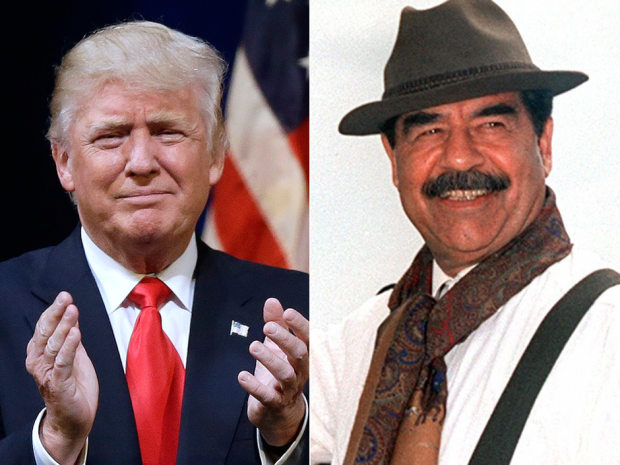 Donald Trump has been lamenting the death of Saddam Hussein for months. On Tuesday, in yet another sign that the general election is less hospitable territory than the Republican primary, his repeated praise of the late Iraqi dictator finally caught up with him. He said of the dictator and I quote ... "He was a bad guy — really bad guy," the presumptive Republican nominee told supporters in Raleigh, North Carolina. "But you know what? He did well. He killed terrorists. He did that so good. They didn't read them the rights. They didn't talk. They were terrorists. Over. Today, Iraq is Harvard for terrorism." He did that so good, huh Donald? Well, at least you found a Muslim you can like. We'll just overlook that he was a despicable dictator. UPDATE Trumps team then tried to make it right. Trying to explain he wasn't praising the bloodthirsty dictator just the bloodthirsty dictator's approach to terrorism. Corey Lewandowski has been ejected off the Trump Train.